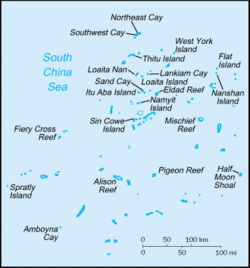 The Spratly Islands are a group o mair nor 750 reefs, islets, atolls, cays an islands in the Sooth Cheenae Sea. The archipelago lies aff the coasts o the Philippines an Malaysie (Sabah), aboot ane third o the wa frae thare tae soothren Vietnam. Thay contain less nor fower square kilometres o land aurie spread ower mair nor 425,000 square kilometres o sea. The Spratlys are ane o three archipelagos o the Sooth Cheenae Sea which comprise mair nor 30,000 islands an reefs an which complicate govrenance an economics in that region o Sootheast Asie. Such sma an remote islands hae little economic value in thairsels, but are important in establishin internaitional bundaries. Thare are nae native islanders but thare are, at least for nou, rich fishin grunds; an ineetial surveys indicate the islands mey contain signeeficant reserves o ile an naitural gas. Aboot 45 islands are occupee'd bi relatively smaa nummers o militar forces frae Vietnam, the Fowkrepublic o Cheenae, the Republic o Cheenae (Taiwan), Malaysie an the Philippines. Brunei haes claimit an EEZ in the sootheastren pairt o the Spratlys an aw encompassin juist ane aurie o smaw islands abuin mean heich watter (on Louisa Reef). ↑ "South China Sea Islands". Terrestrial Ecoregions. World Wildlife Fund. This page wis last eeditit on 25 Mairch 2015, at 04:57.